I'm trying to get myself on a smoothie kick. That way I'll be packing in the fruits I'm wanting to take in every day. I'm always offering my daughter fruit with her meals and as snacks, but for some reason I don't eat it very often myself. It's probably because I'm a salt lover and crave things like potato chips. We all know that chips aren't gonna be doing me much good when it comes to that weight loss New Year's resolution! Smoothies like this one make it easier to get my fruits in and less likely to reach for the chips. 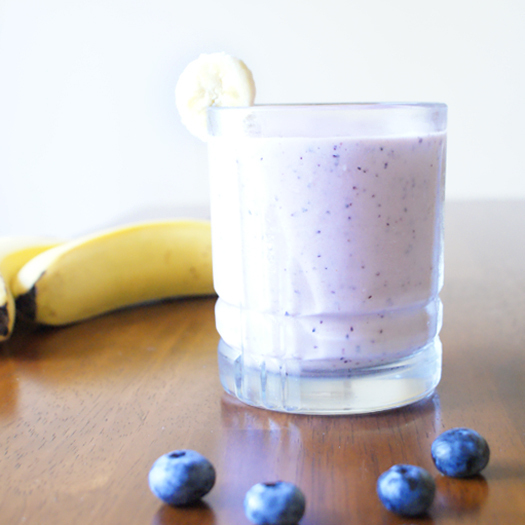 I love a blueberry and banana combination, so this one is perfect for me! You can easily sub out other fruits, though, as long as some of them are frozen. Put all of the ingredients into your blender. Blend until smooth.